mAh per display square in. 307mAh/sqrin. 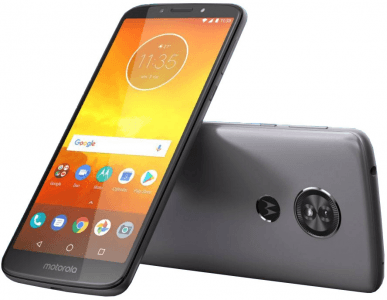 Also known as Moto E 5th Generation, the Moto E5 brings the trendy (as of this write-up) 18:9 aspect ratio to Motorola's mid-range lineup with its 5.7-inch 18:9 HD+ (720p) display, while it comes with a large 4000mAh battery, despite using a middling quad-core 1.4GHz processor. Also, it sports a mere 5-megapixel selfie camera, although one that comes with its own LED flash. Also known as Motorola E5, Motorola Moto E Gen 5, Moto E 5th Generation. Pros and Cons Review The Moto E5 lacks Motorola's trademark water-repellent coating and sticks to a 5-megapixel selfie cam, but it boasts a 4000mAh battery and a large 5.7-inch display. Learn more about its pros and cons in this technical specs analysis. (more) Latest Motorola See all the new Motorola phones.